With the Indian Summer returning after a short break it would have been churlish not to continue my short session carp campaign in search of a monster from the Railway Pond. As it is almost dark by the time the Archers is over I got myself to the water by four with the air temp still in the teens and the sun shining on the barely rippled water. The spots I really fancied were all either taken or would have resulted in me casting too close to someone else, so I opted for the neglected bank. 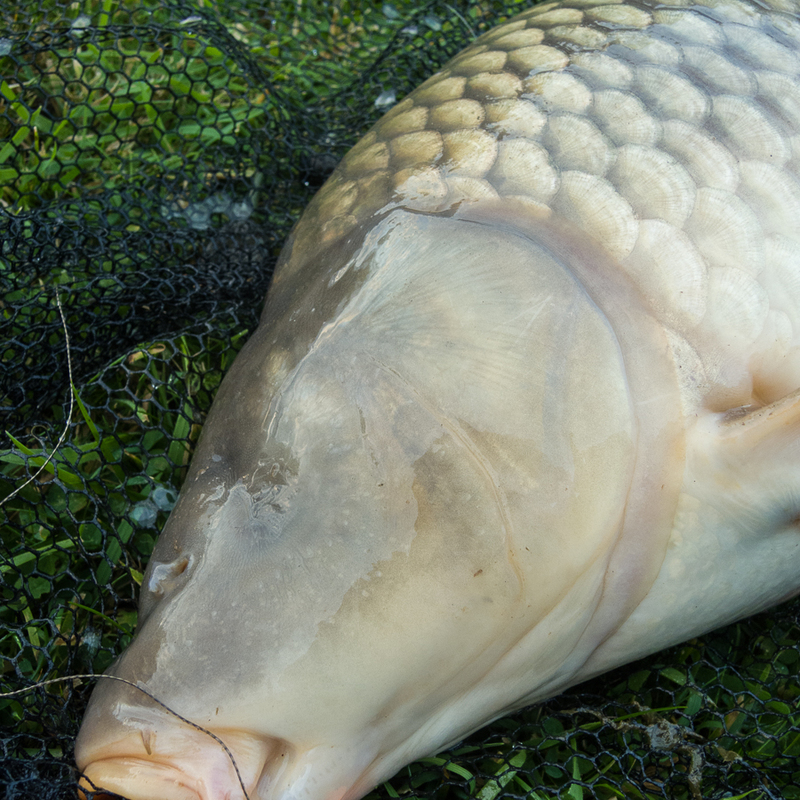 As I approached one swim I could see a carp was feeding close in. That was good enough for me. I set up back from the water then dropped a bait where the fish had been creating vortexes. Scattering a few freebies over the spot. I was using some boilies that had been in the bait cupboard since I last barbel fished. They hadn't gone mouldy, were still soft and sweet smelling. They'd catch. The other rod got a pop-up and a bag of matching bottom baits and was lobbed out about ten yards or so. Although I had a back lead on one line and tungsten tubing on the other I managed to fish with slack lines by resting the bobbins on the platform I had the rods either side of! The margin bobbin jumped off the deck after a short while, but no run materialised. I pulled more slack from the reel and left things as they were. Then the other bobbin leaped into space and the baitrunner spun a little until the line was just tight. I wasn't sure if that had been an abortive take. No. It was another skinny flappy thing which was soon wound in and released. The pop-up got lowered in the right hand margin after that. A couple of hawkers hawked along the reedmace while there was still some heat from the sun. When the air chilled the geese began to arrive, making so much noise I could barely hear the radio. I was half way through the last mini pork pie of the day when there was a stuttery take to the bottom bait. This was being fished on a new rod I've been trying to put a bend in for some weeks, the new-gear-jinx being particularly strong on it. Something was bound to go wrong. I remembered I'd forgotten to retie the knot on that rig. Whatever it was that had picked up the bait it sure wasn't a flappy thing! At one point it tried to get in the reedmace to my right but the potentially dodgy knot held as I gave the fish some stick. Then it kited to the left where I steered it away from the reedmace and over the landing net in one smooth sequence. The rod had done the job, and it looked like I'd achieved my target of catching a double from the place in a short session. The scales proved me right. There was just one strange thing. My knack for catching freakish fish had been at work. The poor thing only had one eye. Whatever had happened to it's left eye had happened a long time ago as there was no sign of any damage. In fact it appeared to have been hatched that way. Most unsettling to look at. The fish was nopt in teh least bothered by it's lack of an eye. Nor had it been put out by my hustling it into the net. It made a good attempt at soaking me as it shot away from teh weighsling as I slipped it back. The usual chaos of wet sling, net and rod was sorted out. The bait dropped back in place and more freebies scattered over it. Then the pork pie was finished. After the commotion I didn't really expect anything more, but I hung on until the Archers was done. The air temp still over 12 by the time I got back to the car. That really is me done with carp for now. The roach rods are rigged up and I have some maggots in the fridge ready for a first session. The plan is to fish a couple of hours into dark for the roach. Knowing my luck the eels will be revelling in this mild weather and I'll be driven home by a succession of rig mangling bootlaces. It might be fun. It might be torment.